Growing your own garden is a basic part of modern survival. The problem, and it is a serious problem, is when you live on the 34th floor of an apartment building in New York City and have not a single handful of dirt to your name, because no dirt means no garden, right? Actually, if you put the technology of hydroponics to work for you, dirt becomes superfluous. The word “hydroponics” comes from the Greek words “hydro,” meaning water, and “ponics,” meaning labor. Literally it means allow the water to do the work. 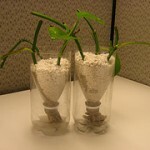 With hydroponics, water certainly does do the work. There are several different permutations on the basic idea of suspending growing plants in a liquid nutrient mix. What researchers and experimental horticulturists have discovered is that soil is not essential to healthy plant growth. Nutrients crucial to a plant’s growth can be introduced just as easily after being dissolved in water and introduced to the root system that way. 1. Allows urban dwellers to raise their own food, without a dedicated yard. 2. The nutrient solution recycles constantly through the closed system, which means less waste and less water demand. 3. It is possible to control the level of nutrient delivered to the plant – thus no more overfeeding. 4. Pests and disease are easier to prevent and eliminate because of the plant’s individual mobility. If you’re interested, further research on the topic is readily available on the Internet. An exhaustive discussion goes beyond the scope of this single entry. For now, we just want to briefly discuss the two main types of hydroponic systems. The first is “solution hydroponics,” where a plant’s roots are submerged in nothing but either a liquid solution continuously flowing over them or allowed to sit in a standing pool of the solution. The other system is called “medium hydroponics,” involves using a soil substitute like sand, gravel or rockwool. Ultimately, the lesson for the modern survivalist to take away is that having no dirt or yard is no excuse for not growing a garden. 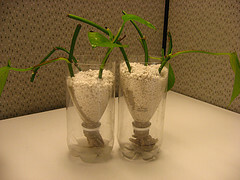 A hydroponics system can be easily set up in a spare bedroom, den, or balcony. If you’re beginning to see the possibilities, there’s nothing left to say except get busy growing!